Take an exciting historical journey with Bubble Bubble game forfree! Travel across ancient lands, see all the fascinating sitesand shoot and pop bubbles in over 800 levels! Awesome boosts *Beehive – Drop 10 bubbles or more and a swarm of angry bees willclear all the bubbles around it. * Magic beam – Pop 7 bubbles in arow and a powerful magic beam will cut a path.How to Play* Match atleast 3 bubbles of the same color to pop the group. * Drag yourfinger to move the laser aiming, and lift it to shoot bubbles! 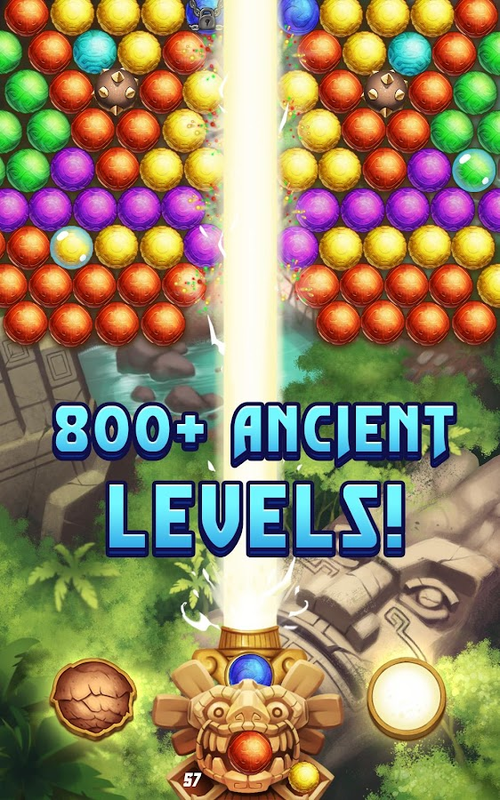 *More than 800 ancient levels* There’s no time limit, but you have alimited number of shots to clear the level. * Swap bubbles withoutlimit-Change the color of your bubble with a tap.It’s a bubblepopping delight you don’t want to miss!All rights of BubbleShooter™ are owned by Ilyon Dynamics Ltd.
Start your engines and get ready to shoot and pop bubbles in thebest shooter game! Unlock cool boosts & win coins! Power Pop ™Bubbles is an addictive, exciting, brain-training puzzle game withthousands of fun levels packed with awesome challenges, power-ups,and effects. Play for free today and join the bubble popping mania!Shoot and burst all the colorful balls and solve the fun puzzlesand challenges to level up. 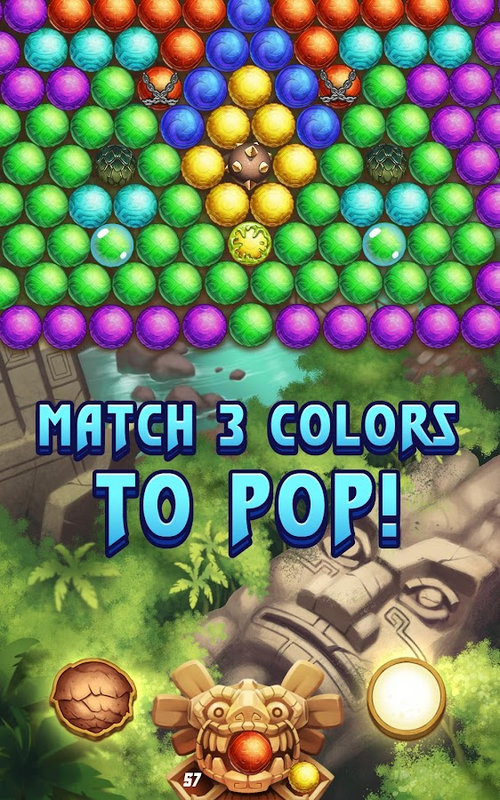 Make combinations of 3 or moreidentically colored balls to pop the group and blast the bubblesaway. Aim carefully to hit the target, strike and drop big groupsof bubbles and clear the board. With cool new items and effects,powerful boosters and tons of puzzle levels, you just won’t put itdown- Try it out today! COOL FEATURES Addictive gameplay. Play andenjoy hours of endless fun. Thousands of incredible levels packedwith fun puzzles and challenges. Bubble swap is free, just tap onyour bubble to change its color. Awesome features and effects.Classic and most addicting gameplay. Easy to learn and super fun toplay. Test your matching skills in thousands of exciting levels. Nowifi connection is needed so you can enjoy an unlimited bubblepopping fun! This amazing shooter game will test your strategy andplanning skills in thousands of exciting puzzles and brain-teasers.Download now and play for hours! MATCH COLORS & BURST BUBBLESPower Pop ™ Bubbles is the best game to play when you have somefree time, or when you’re looking for a fun activity to share withfriends and family. Get it now and enjoy this fun puzzle gamedesigned to keep your brain sharp and active. TIP: Drop the biggroups of bubbles first so you can clear a path. See which bubblecolor you are getting next so you can work out a strategy to popyour way to victory and remove all the bubbles from the board. Youcan restart any level without having to wait for lives, as they areunlimited! BOOST YOUR SKILLS Earn awesome power-ups and blastthrough the challenges: * Make 7 shots in a row to earn a FIREBALLthat will burn up bubbles on the way. * Drop 10 balls or more andget a BOMB that will take out surrounding bubbles. Do you have aknack for logic and puzzle games? PLAY Power Pop ™ bubbles now andhave fun bursting the balls in this online bubble shooter game.Dive into the balloon popping fun and discover amazing levels, cooleffects, and challenging puzzles. Download and play anywhere you’dlike, online or offline - no internet connection is needed. Takeyour time and plan your every move, play today and win rewards! Howto Play * Drag your finger to move the laser aiming and lift it toshoot bubbles. * Match at least 3 bubbles of the same color or moreto pop the group and win points. * Boost your experience withawesome power-ups. * Swap and match balls and win coins. * Aim andshoot matching bubbles and win big. * Use your moves efficiently toovercome all obstacles and complete levels. * Solve the funpuzzles. * Pop and burst balls and clear the board. * Reach highscores by using the powerful fireball & bomb boosters * Masterall the different challenges. Liked the game? We would love to getyour feedback! Let us know what we can add to make your gameplayeven more enjoyable and earn your 5-star review. Have any questionsfor us? Contact our support team at [email protected] Follow us fornews, updates and fun surprises! Visit our Facebook page:https://www.facebook.com/powerpopbubble/ All rights of Power Pop ™are owned by Ilyon Dynamics Ltd. Bubble Shooter ™ 2 is an addictive bubble popping game withhundreds of puzzle levels and fun challenges. Play for free todayand join the balloon crushing fun! Shoot and pop colorful bubbledrops in this relaxing board game and work your way through all thebubble-packed puzzles and brain teasers. Complete levels and wincoins! This fun bubble shooter ™ game is easy just to pick up andplay, perfect for the whole family to play and enjoy. Start theadventure now, hit and blast the balls and discover the mostclassic and amazing puzzle game! The struggle to pop all thebubbles continues! 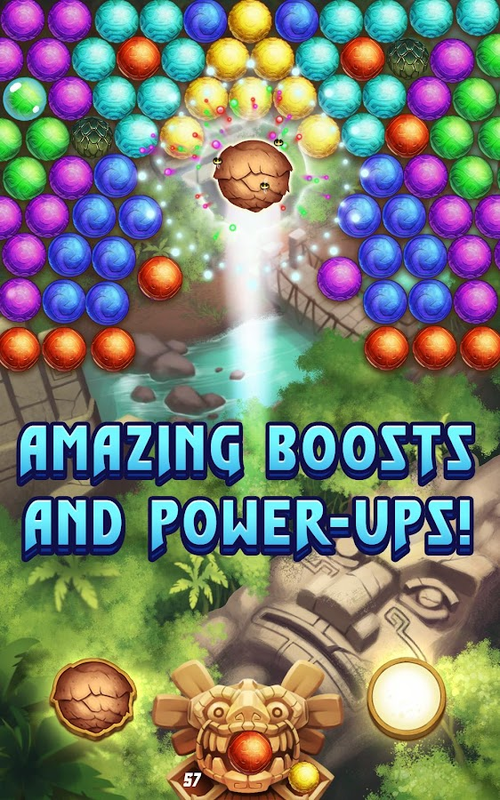 Conquer challenging levels with powerful boostsin this thrilling bubble pop adventure and experience hours ofbubble matching, popping and blasting fun! Bubble Shooter ™ 2puzzle game is definitely on the list of things you would take withyou to a deserted island! If you used to love going to the arcadeand playing fun bubble shooter ™ retro games, get ready to takeyour passion to the next level! Try out the best vintage game andput your strategy skills to the test. Get it now for free and playeverywhere, anywhere and as much as you want. No internetconnection is needed. IN BUBBLE SHOOTER ™ 2 YOU’LL GET TO: *Challenge yourself with hundreds of puzzle levels and brainteasers. * Practice your strategy and color matching skills. * Makecombinations of 3 or more identically colored balloons to burst. *Match and pop bubbles and clear the board. * Unlock powerful boostsand power-ups and use them to explode bubbles. * Exercise yourbrain and your fingers, aim and smash the balls and win coins. *Explore hundreds of addictive levels filled with cool effects anddesigns. * Play anytime and anywhere you want, no wifi needed!Charge up with awesome boosters that will help you blast throughthe levels: 🔥 Pop 7 bubbles in a row to get a FIREBALL that willburn up bubbles on the way. 💣 Drop 10 bubbles or more to get abubble BOMB will take out surrounding bubbles. Make sure to saveyour boosts until you need them! FUN FEATURES - Hundreds of amazingpuzzle levels with new challenges. - The favorite arcade game in abrand-new mobile version. - Action-packed gameplay. Simple to learnand super fun! - Plenty of amazing brain teasers, powerful boosts,and free gifts. - Fun bubble game for the whole family to play andenjoy. - Free to play and totally addictive. PLAY THE BEST PUZZLEGAME Bubble Shooter ™ 2 is a relaxing, fun bubble popping game thatwill keep you entertained for hours and even days. Heads Up: thelonger you play, the more addicted you’ll get! TIP: Try to clear alevel with fewer moves to get a higher score. Each new level has adifferent target you need to reach, so plan your moves carefullyand fire away. You can restart any level without having to wait forlives, as they are unlimited! Join the fun adventure today. Showyour skills, blast the bubbles, solve all the puzzles and winawesome boosts that will reward you with high scores and coins!Bubble Shooter ™ 2 is a super fun and addictive bubble shooter ™game you won’t stop playing! Even if you get stuck on a desertedisland the best way to pass the time is to play this awesome bubbleshooter ™ game! Liked the game? We would love to get your feedback!Let us know what we can add to make your gameplay even moreenjoyable and earn your 5-star review. All rights of Bubble Shooter™ are owned by Ilyon Dynamics Ltd.
It’s time to get Pro! Had enough from easy winning Bubble shootergames? Try this new challenging and skillful required BubbleShooter Game! There are more than 800 professional levels filledwith Bubbles, Boosts and Bombs.in this Bubble Shooting, fun filledfollow up to the classic Bubble Shooter. You goal is to use theproperties of the bubbles and boosts to match at least 3 coloredbubbles, complete the level and earn three stars. Can you do it?There are over 800 to complete. 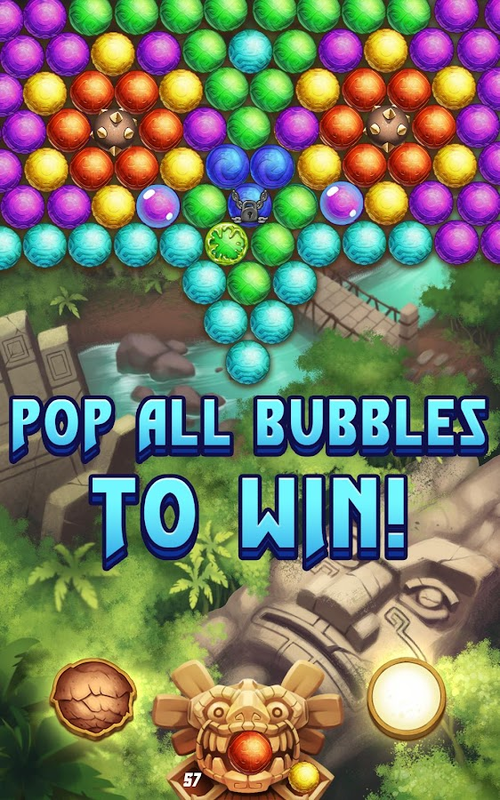 With Awesome Power ups and boosts!✪Fireball – pop 7 bubbles in a row. It’ll burn every bubble on theway✪ Bomb – drop 10 bubbles or more. It’ll explode all surroundingbubblesEncounter these awesome bubbles:✪ Stone Bubble – you can’tpop it but you sure can drop it✪ Chained bubbles - you have tobreak its chains before you can pop it✪ Slime Bubble – fear theslime, can it be contained?✪ Diamond Bubble – only bomb and firebubbles can help on this oneAre you ready to take your place in thebubble popping pantheon? Try it out now! It’s Free!All rights ofBubble Shooter™ are owned by Ilyon Dynamics Ltd.
A NEW version of the all known famous Bubble Shooter is nowavailable for you to download for free.Enjoy the new Candy-BallBoost as well as new Multicolored bubble-bombs.Shoot and pop allthe bubbles with over 800+ levels, by matching 3+ colors to winBubble Shooter. * There are 800 bubble-filled levels to beat. * Matchthree colors to pop those bubbles and clear them away. * Pop themall before your shots run out. * Change the color of your bubblewith a tap. * Combos and chains score big!All rights of BubbleShooter™ are owned by Ilyon Dynamics Ltd. 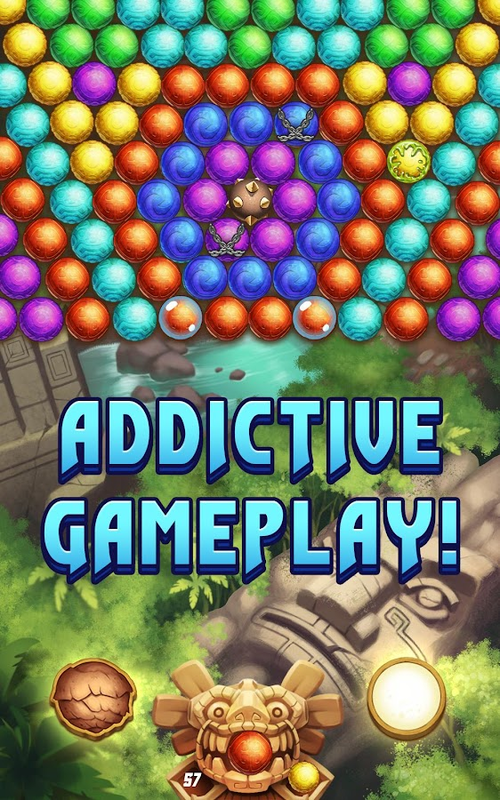 Bubble Island Rescue - the most fun and addictive bubble shooterpuzzle game.Where are the lost baby parrots?The evil tiger isthreatening the baby parrots. can you rescue them?Pop bubbles andfree them!Pop bubblesMatch 3 or more bubbles of the same color andthey will popRescue all the parrots to win each levelEarn stars bywinning with less shotsUse the cool laser target to aimSwap bubblesfor free!500 Amazing puzzle levelsBeautiful island theme with cuteorange baby parrots flyingEasy to learn, fun to master!! !Shootbubbles and be the best bird saver!All rights of Bubble Shooter™are owned by Ilyon Dynamics Ltd. The bubbles are invading from outer space. Can you shoot them alldown before it’s too late? You have a limited number of shots, sopick your targets carefully. Match three or more of the same colorto pop those bubbles and clear the skies. Humanity won’t be safeuntil all of the bubbles are gone!★ Beat 500 levels to save thegalaxy!★ Can you clear the sky before you run out of shots?★ Tap tochange the color of your bubble.★ The fewer shots you use, thehigher your score.★ Dual-colored bubbles mix things up.Puzzle yourway to victory on this classic Puzzle Bubble Shooter and work outhow to clear the skies. Take aim at the right spots to burst largegroups of bubbles and clear them all away. Pop all the bubbles inas few shots as possible if you want to build a big score. Can youachieve three stars on every level?All rights of Bubble Shooter™are owned by Ilyon Dynamics Ltd.